We’ve had great feedback from subscribers who tell us they love the procedure cards in their Way We Do manual because the visual format of the cards makes it easy to navigate and find procedures. Now, we’ve given you even more to love by adding the ability to control the content and appearance of each procedure card in your manual. To ensure that you are able to view and use this new feature, we recommend doing a hard refresh on your computer while you are in your Way We Do manual. To perform a hard refresh, press the Ctrl + F5 buttons on a PC, or Cmd + Shift + R on a Mac. You can now change the title and description of each card, and add images that increase your brand awareness and make it easier for your team to recognize the procedures they need. Simply click the gear icon on the procedure card to get started. The procedure title is automatically added to the procedure card from the title provided on the policy or procedure. You can now change the title on the procedure card without affecting the way the title appears in the actual policy or procedure. Currently, the description for each procedure card is automatically taken from the first paragraph written in the procedure. 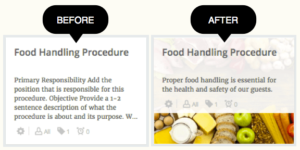 You can now edit the description on the procedure card to better represent the information inside without affecting any of the original content in the policy or procedure. 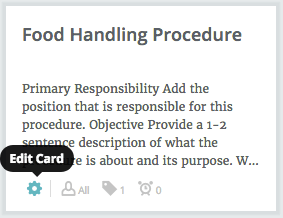 You can further customize the procedure card by adding a background image. Adding an image not only looks great, but it will also help your team members to quickly identify specific categories or procedures that they are looking for. A full tutorial for customizing your procedure cards is available on our support website. As usual, feel free to contact the support team with any questions or comments. Time management gurus the world over espouse the wonders of color coding. Dial yours up a notch with procedure card colors!